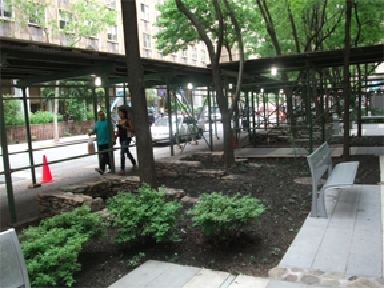 So how do we create hundreds of small parks in Manhattan? 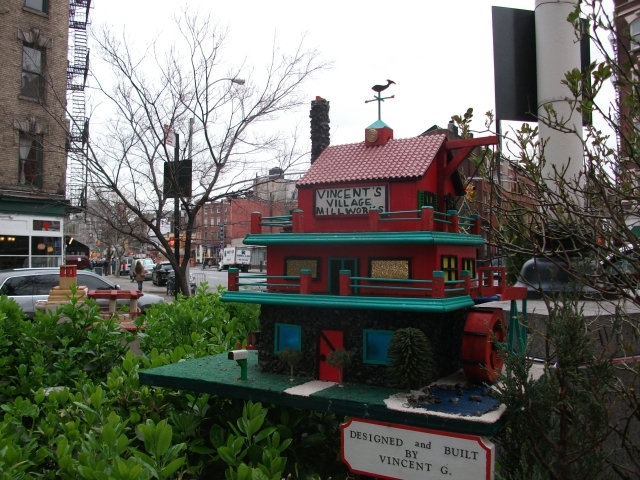 It can't be done through our current centralized parks building model. First off city parks cost million of dollars to create. 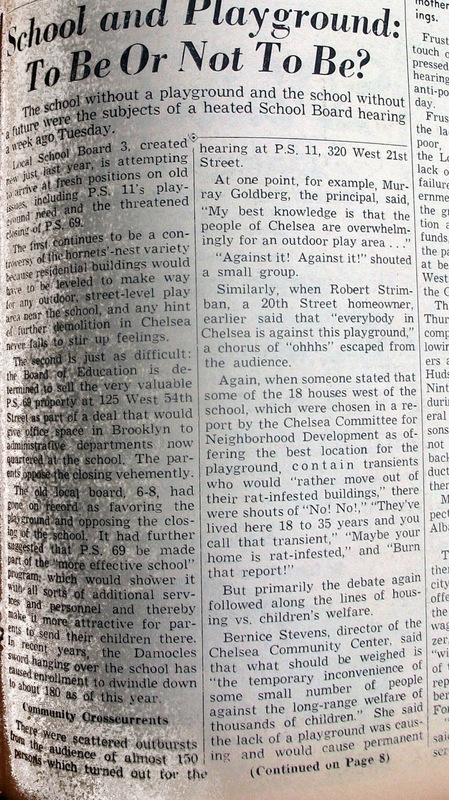 A recent NY Post article showed several playgrounds being build at a cost of $3.8 million and up. 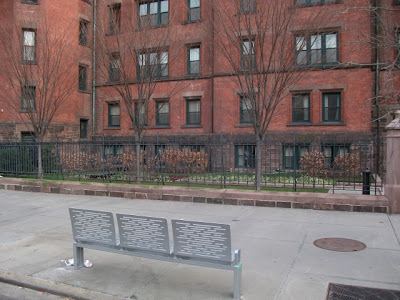 Just renovating the Matthews Palmer playground in Hell's Kitchen will cost $1.8 million dollars. 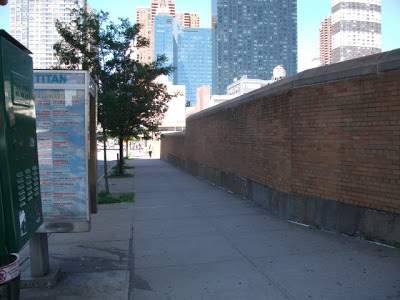 And even if we had the funds there simply isn't enough city owned open space in Manhattan to do so. 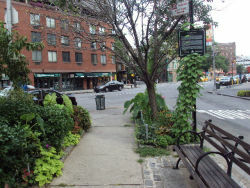 However scores of "3 minute parks" can be created in a community by using a variety of alternative open space creation techniques. Standardized street furniture can be placed on sidewalks and in car parking spot. 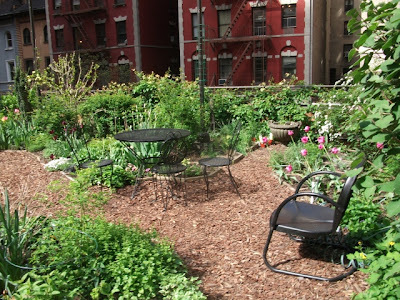 The Desmond Tutu center garden is private property generally open to hotel guests only. 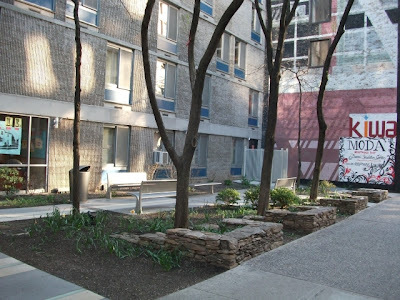 Adding a bench in front of Desmond Tu Tu Garden creates a spot on public property to relax and enjoy a view of the private garden. Through NYC's Citybench program Chelsea has added 18 benches in locations that are useful to our seniors. 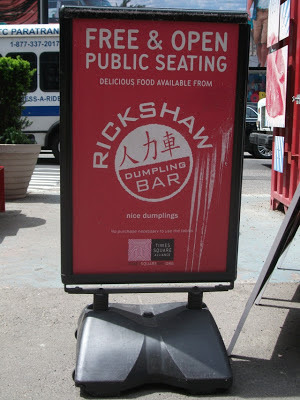 As I walked past the new Moonstruck diner on 9th Ave, I noticed an older woman walking in the opposite direction. 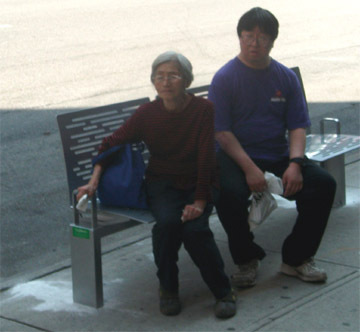 I thought "here's a person that can use this bench" Sure enough she and her companion had a seat there. 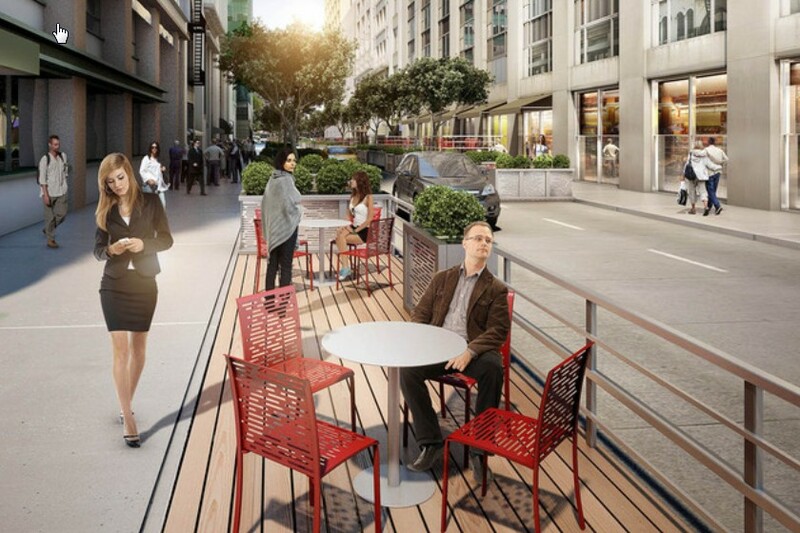 This parklet that will be placed on 41st Between 6th and 7th Avenues, transforms several parking spots into outdoor seating. 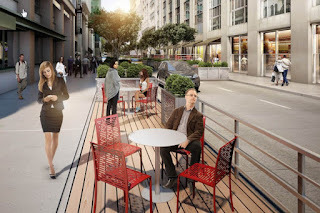 Parklets transform several parking spaces for cars into parking spaces for people. Cost $10,000-$30,000 each. 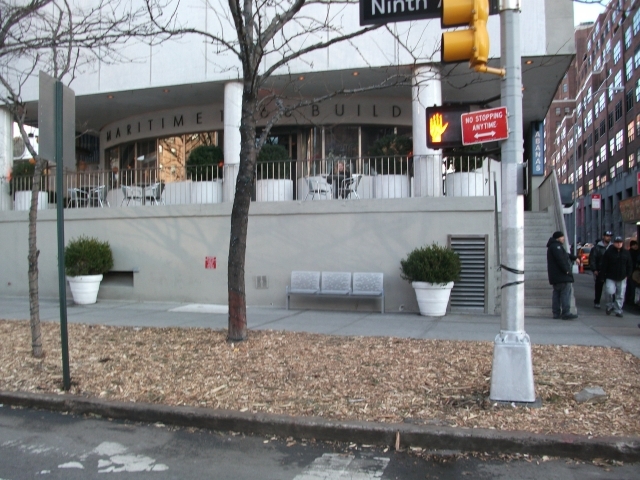 It is the NYC's s first site-specific parklet that is not in front of a restaurant. 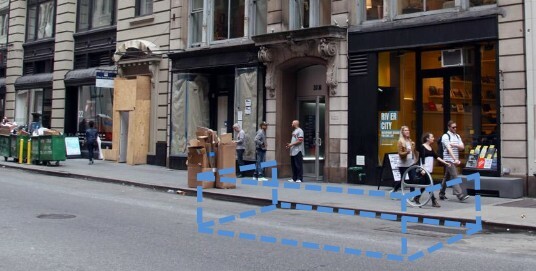 Along with the recent installation of 10 Citibenches (white dots below) installing more parklets like the Van Alen Parklet (red pin below)are a key element in the creation of an Age-friendly Midtown South. Los Angeles has installed the nations first active recreation parklet. It includes foosball, fitness equipmen and seat swings.If the first parklets that LA has installed work out, the city expects to install hundreds of them. 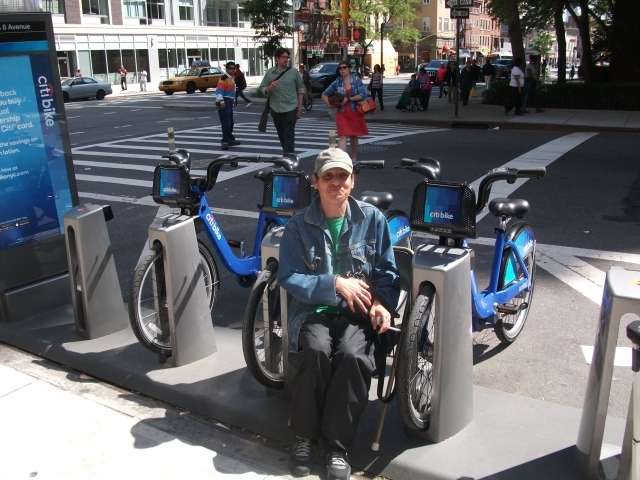 Actually our Citibike stations are currently being shared in an "off-label" fashion. 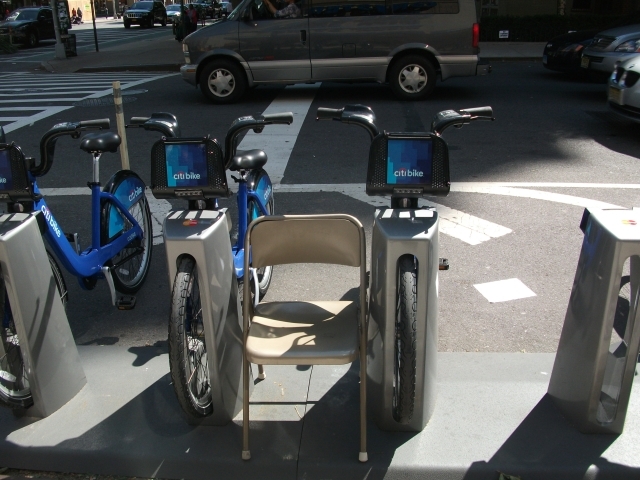 Currently the Citibike docks are being used as a place to lean on. And people are sitting on the bikes. 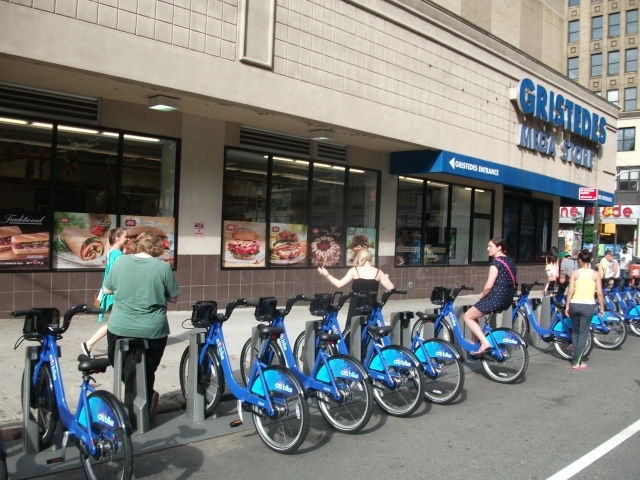 These are excellent "off label" uses of the Citibike stations. However these "off label" uses are not optimal for the comfort of the people sitting/leaning. And these off label uses are not safe for older people. Adding seating to Bikeshare station would initially create up to 300 street seats locations., 600 when the system reaches its next expansion. 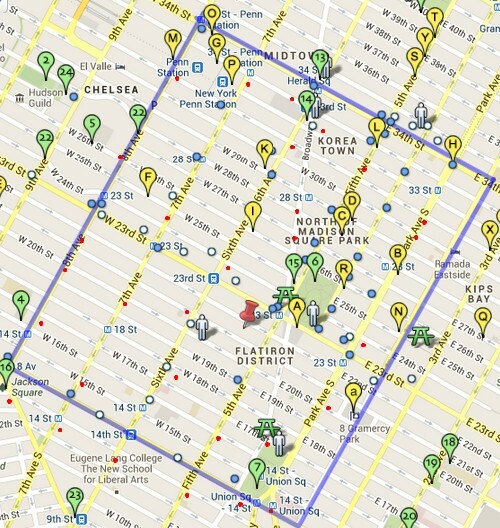 And possibly thousands if the system is expanded throughout the 5 boroughs. 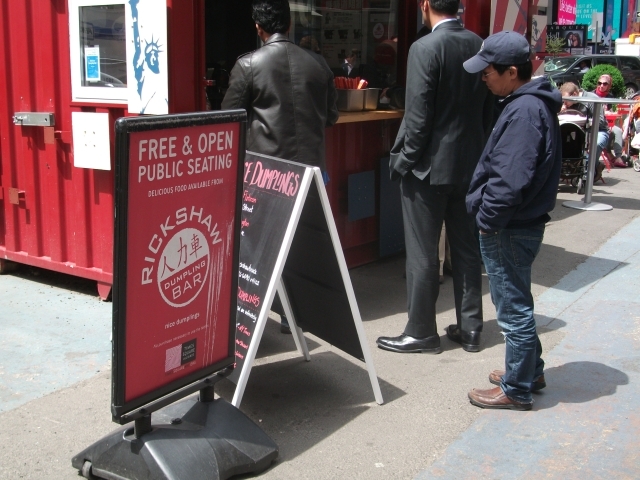 Parklets and sidewalk park benches can be implemented almost anywhere, quickly, and at at minimal cost. But they have limitations of capacity and functions that they are able to offer. To meet those needs a host of site specific building blocks are available. 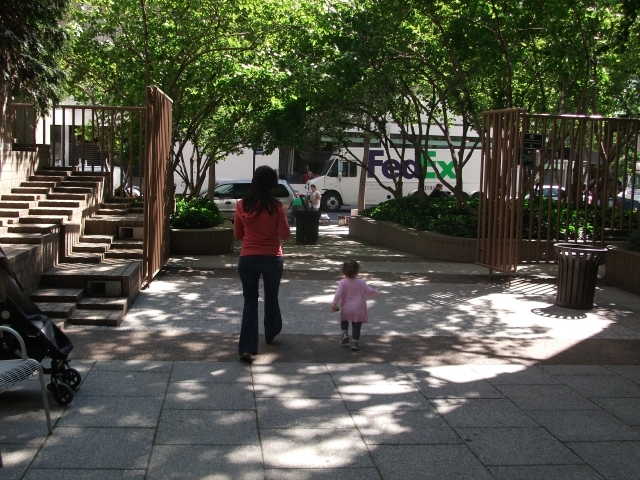 Turning unused roadway space into street plazas areas is a great idea. 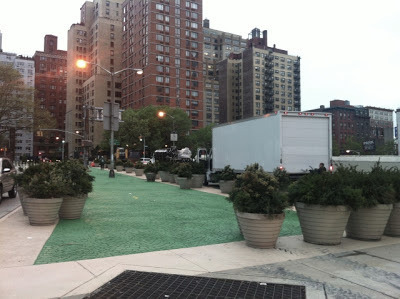 Most of Chelsea is on the grid system and has very few locations that can be transformed into plazas.
. A "dead block" fronting a school playground transformed into a sidewalk park. 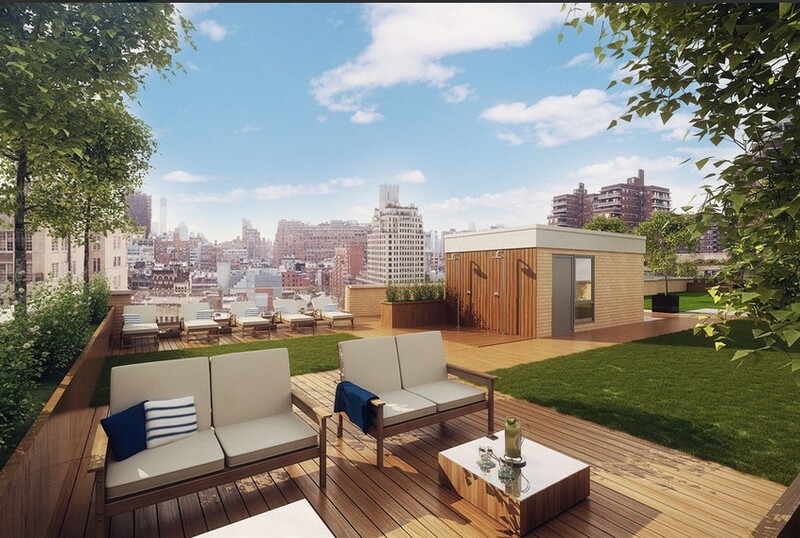 West 77th Street Columbus Ave Cost $100,000. 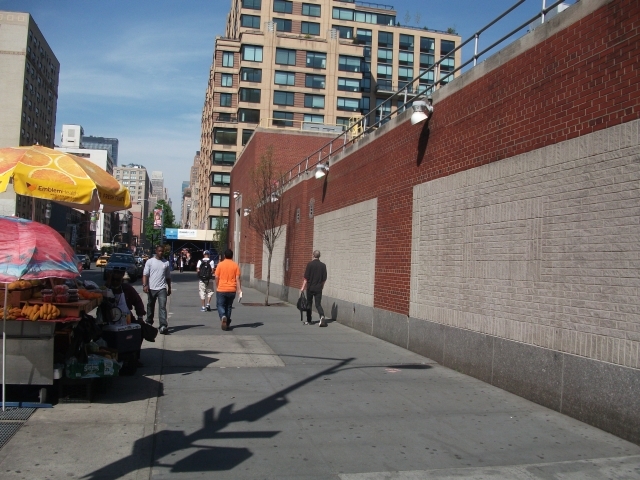 Here's a dead avenue block in Hell's Kitchen on 39th St and 10th Ave that has potential for a sidewalk park. 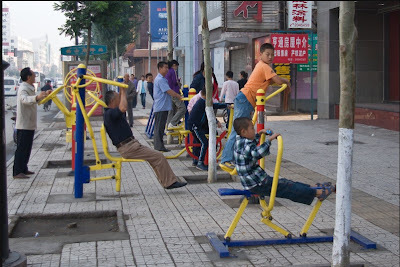 Sidewalk in China with active recreation equipment. The sidewalk shown here is wider than our sidewalks. What that means is that the types of of active recreation equipment we could install would need to be more compact then those used in China. 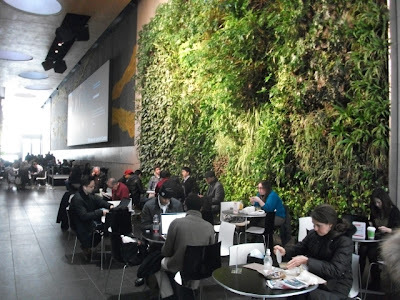 The Highline may be the worlds best known SkyParks. there are other ways to create parks up in the Sky. At the Columbus Condominium the Lotus Garden is on the roof of the garage parking. It is open to garden members all the time, and the public on Sunday afternoons. How about we start building affordable housing with PUBLIC roof open space access. Access doesn't have to be for everyone. If a playground is built on a rooftop, access would be for kids and their parents only. If a community garden, it would be for people who maintain the garden, plus limited access for others. 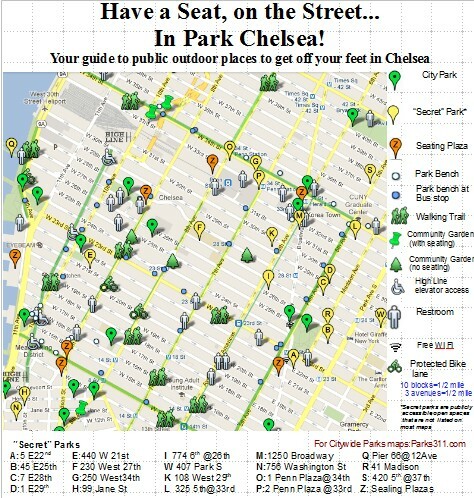 This is a map of all the Public Indoor spaces in and around Chelsea that are open to everyone, and cost nothing to use. . They are all libraries. Many outdoor recreation spaces are only used when the weather is good. We need more indoor spaces. When building affordable housing, we give a great deal to the people getting the housing, but tend to create private recreation spaces for the residents of the housing, rather then creating public spaces for the benefit of all. 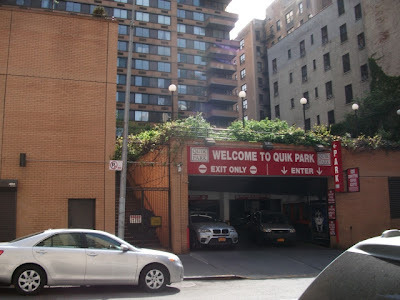 I'd like to suggest when we build affordable housing in Chelsea we have a great opportunity to create the pubic indoor recreation spaces that Chelsea lacks. 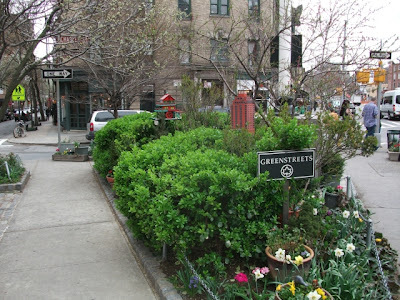 This Greenstreets location had no seating, I requested a Citybench be placed here. Now we have seating and free Wi-Fi access at this spot . Now it could use more greenery. I could see this spot transformed into a Community garden worked on by either the students at the School of Visual Arts on this block, and/or workers in the Google building on the next block. PS 11 in Chelsea was rented on weekends to a Church group. I would see church members play basketball there. 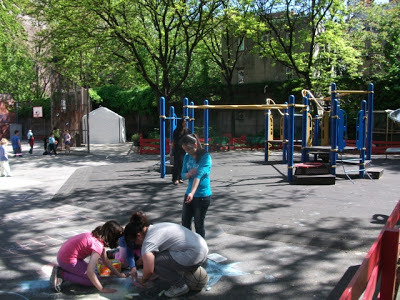 Hundreds of schoolyards are in the Schoolyards into Playgrounds program. This yard is not in the program. why not? 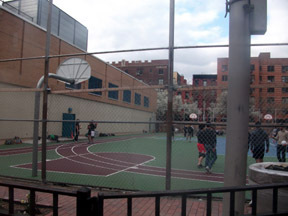 Alternatively if the school was rented to a church, I see no reason that the PS11 schoolyard can't be rented to the city as a playground after school and on weekends. Prior to 1966 the PS11 schoolyard was the location of private housing. 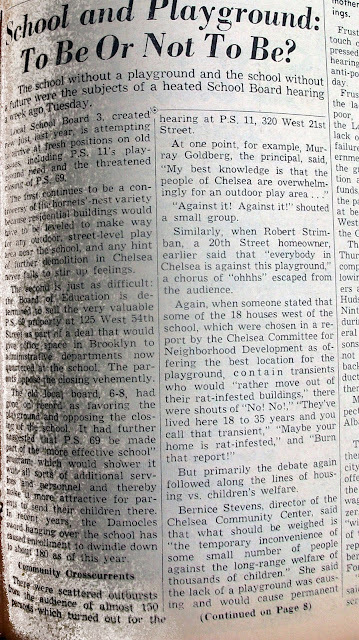 In arguing for the razing of the houses the schools principal Mr Goldberg said "the community too needs a park area" There are two areas in PS 11 that can become public parks, one of which had been promised to be so almost 50 years ago. The Museum Lab School has just gotten a active recreation park renovation. 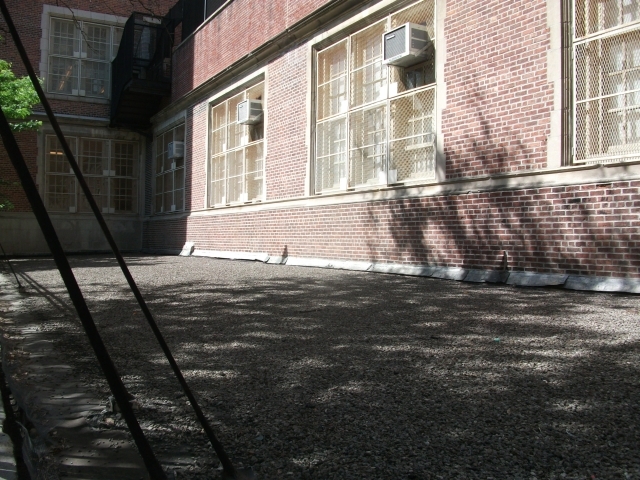 Looking at similar schoolyard renovation contracts I estimate this renovation cost well over a million dollars. On weekends it is rented to private groups. How about instead renting it to the city on weekends to keep it open for the community, rather then a private group. 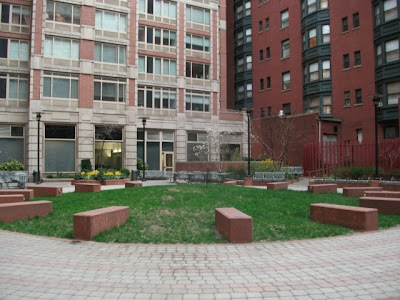 “While researching our 2012 map update we located a veritable treasure trove of open space opportunities that we realized most Chelsea residents had no idea existed. “ says Arnold Bob, better known as Ranger Bob, Park Chelsea’s Parks Commissioner. 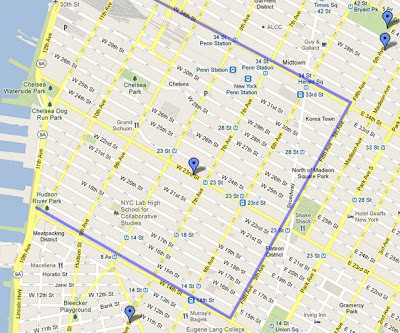 “ Most of these spaces are part of the NYC Privately Owned Public Space (POPS) program, where building owners are given zoning variances in return for creating public spaces. However, several factors have conspired to make these spaces relatively invisible to their intended users. Madison Belvedere, Privately owned public space 28th St between 5th and Madison Ave. In a neighborhood with little green space this POPS is barely used.I talked with some black car drivers who were standing on the street in front of it. When asked why they didn't use it they said because it was private space. There is a sign saying that it is a public space,but it's possible most people don't notice it. POPS at 230 27th St. Upon first being shown the 2012 ParkChelsea map, one Chelsea senior noted that for years she would be coming home from shopping with heavy bags, she would see the listed area(above) , but thinking it was private property, just walk past it. Now she knows it is a public open space where she can stop and rest on her way home. POPS owners cannot be made to add signage revealing the public nature of their spaces, however it is possible for the city to place signs as the above on the streets in front of these properties.